Ensure that you have Skype Credit. You can’t make a “real” phone call unless you have Skype Credit on your account. You add Skype Credit by touching the Profile button on the main Skype screen and choosing Skype Credit. 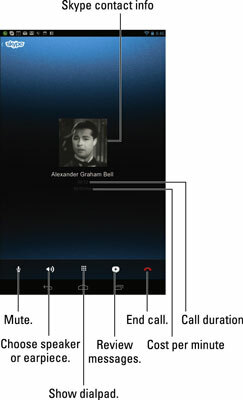 From the Skype app’s main screen, touch the Call Phones button. You see a big dial pad for typing phone numbers, just as you would if the Nexus 7 were a huge cell phone. Type the phone number to dial. Or use the Contacts button in the upper-right corner of the screen (shown in the margin) to summon a contact. Choosing a contact places his number on the Call tab. Always type the full phone number when making a Skype phone call, including the country code, shown as +1 for the United States, as well as the area code. If you need to be specific, touch the Flag button to the left of the number and select the proper country. Touch the Call button to place the call. The Skype app uses the Nexus 7’s Wi-Fi Internet connection to place the call. To end the call, touch the red End Call button. Lamentably, you can’t receive a phone call using Skype on your Nexus 7 from a cell phone or landline unless you pay for a Skype online number. In that case, you can use Skype to both send and receive regular phone calls. You should get a good headset if you plan to use Skype often to place phone calls. If you do, ensure that you choose the Earpiece option from the Speaker button. In addition to having to pay the per-minute cost, you may be charged a connection fee for making the call. You can check the Skype website for a current list of call rates, for both domestic and international calls. Unless you’ve paid Skype to have a specific phone number, the phone number shown on the recipient’s Caller ID screen is something unexpected — often, merely the text Unknown. You might therefore want to e-mail the person you’re calling and let her know that you’re placing a Skype call. That way, the call won’t be skipped because the Caller ID isn’t recognized.